It’s one of the most fundamental building blocks of a relationship. In fact, for many people trust is the cornerstone of a relationship — whether romantic or platonic — and is the piece that determines the success or failure of the whole metaphorical building. For me, trust is a cornerstone. I’ve been in all kinds of friendships and relationships where I’ve trusted someone, only for them to turn around and abuse that trust. I’ve wound up hurt and confused, watching that building tumble down. 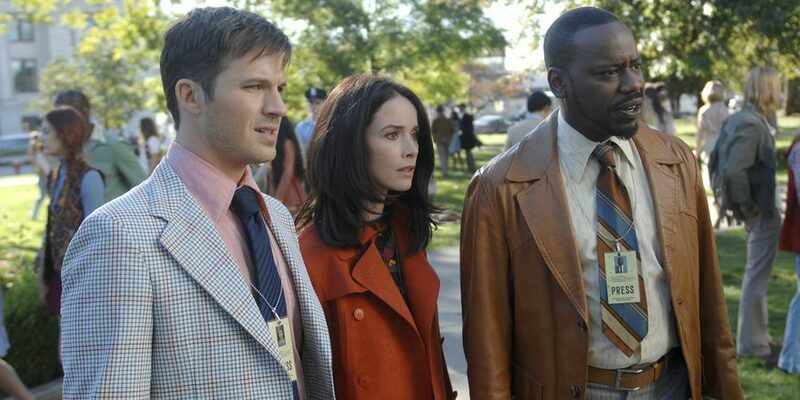 And for the characters on Timeless, “The Watergate Tape” is that moment of destruction. We’re forced to watch this week as Rufus, Lucy, and Wyatt embark on a trip, united in their mission only to return fractured and heartbroken over the people they thought they knew. 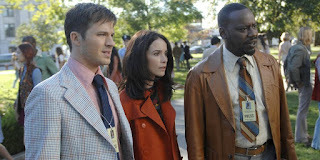 I really enjoyed this episode for the most part (though I admit that the pacing in the middle was a bit slow and I might have missed a few things due to my mind wandering) because it was character-focused and gave us answers to questions about Rittenhouse, while introducing organic sources of conflict and a villainous plot that ran parallel to what we were used to. Let’s get the plot out of the way, here: the team is sent back to 1972, the day that Richard Nixon recorded that infamous White House tape with the missing 18-plus minute gap in it. Honestly, I’m not much of a history buff at all and have zoned out in every single history class I’ve taken, but even I’ve heard of Watergate and know the gist of it. Apparently, Rufus doesn’t know much of anything which is both shocking and unbelievable. At any rate, the team arrives just in time to walk into The White House with their fake press credentials. ... Unfortunately, Flynn’s men beat them to the punch and kidnap them all. While the team initially landed in the 70s to prevent Flynn from stealing the Nixon tapes, they realize something comically shocking upon awaking — Flynn has already stolen them! I think this is my favorite part of the episode, to be honest: the fact that we were only a few minutes into the episode and the villain already succeeded. But Flynn needs something else: a doc that is referenced in the tapes by Nixon (who is being blackmailed by Rittenhouse). Once he plays the tape, Rufus internally squirms and Lucy externally does. You see, what Garcia Flynn does so well in this episode is pull at the unraveling threads of trust that are dangling between the team. Rufus, Wyatt, and Lucy all have different reasons for being a part of their team and they don’t know one another super well yet. But they’ve bonded pretty quickly and there’s a level of trust that has been cemented over the past few episodes, especially between Wyatt and Lucy. And that makes Flynn’s reveal sting even more. He tells the group that he and Lucy have chatted privately (which they have) throughout history about Rittenhouse, about a journal that she supposedly will write, and about his motivations. Wyatt and Rufus are understandably feeling betrayed as Lucy tries to excuse her reasons for hiding this from them. They’re not bad reasons — I would argue that they’re valid — but they’re lies of omission even so. And those lies of omission turn into seeds planted into the minds of Rufus and Wyatt, the latter especially so. I enjoy the fact that Garcia Flynn’s purpose in this episode wasn’t to mess with history as much as it was to mess with the team. He isolated Wyatt for a reason, I believe, and that reason was to water the seeds of doubt. Undoubtedly knowing how Wyatt protects and cares about Lucy, the easiest way to fracture the team further is for Flynn to go after Wyatt’s biggest pressure point: his deceased wife. Flynn pulls all of the classic, subtle and manipulative villain routines: he waxes poetic about his sad backstory, talking about how Rittenhouse is responsible for the deaths of his wife and daughter. He makes himself more relatable to Wyatt in this way, even if the latter doesn’t fully believe him or his cause. And then, Flynn returns to Lucy’s journal, dredging up the earlier feelings of doubt and betrayal. Finally, Flynn goes for the gut punch — he reveals that Lucy wrote about Wyatt’s dead wife in her journal. And the more Flynn discusses his wife, the angrier Wyatt grows. ... And the more Flynn’s plan works. It doesn’t take long for Lucy’s trust in Rufus to unravel, either. Part of the reason the plot of the episode worked well for me was because it was layered: there were two sets of villains — Flynn and Rittenhouse. At the beginning of the episode, Rufus is confronted by Creepy Rittenhouse Dude and Connor Mason, the former telling him to continue to spy on Lucy and Wyatt and to also call a cryptic number once the team gets to 1972. Rufus does as he’s instructed and checks in with the person on the other line, who gives him orders. But when Lucy and Rufus unravel the truth of the doc — that it’s a young, brilliant woman and not a physical document — and anonymous Rittenhouse guy tells Rufus to “get rid” of the doc, our pilot begins to spiral into panic. His panic mode is activated further with the voice tells him that if Rufus can’t do the job, he will. Rufus destroys the recording and then confronts a very bewildered Lucy about what’s happening. And then he confesses to everything that’s happened. Lucy is understandably upset and feels betrayed (not a nice feeling, is it, Lucy?) by Rufus, who knew about Rittenhouse the whole time. Instead of working together, the secrets have only managed to drive a deep wedge between the two of them. It’s painful to watch Lucy and Rufus have a hushed argument about how they’ve both been lying to one another — and to Wyatt. Lucy doesn’t know who to trust anymore, and neither does Rufus. It’s this kind of moment that is a make-or-break one for the team. In the end, Rufus and Lucy use their combined knowledge and skills to save the Doc (now capitalized because she’s an actual super intelligent human being), but the price they pay for the secrets spilled might prove to be too much. When the team returns to the present, they all are extremely tentative around one another. That’s the thing about secrets — they have the tendency to destroy relationships. Do I think that Wyatt, Lucy, and Rufus are demolished for good? Absolutely not. I think that next week’s episode is going to be a really important one for them. Because not only are they fresh from the wounds of betrayal, but they’ll be thrust into a battlefield in which they’ll need to rely on one another to stay alive. Nothing forges a team more than fire, eh? At the end of the episode, Lucy meets her father who is named Benjamin Cahill. She’s too nervous to tell him who she is and why she’s visited his house. But he clearly knows who she is, as he calls someone as soon as she leaves. Ruh-roh. I wonder if this has anything to do with Rittenhouse. Speaking of family, we get to see Rufus’ mother and hear mention of his brother. Fun! I kinda want Lucy’s necklace in this episode. “Wyatt, help!” “LUCY!” He’s so attentive, you guys. “I know. Time travel, right?” That’s it. That’s the show. In this week’s “pick a name” game, Rufus refers to himself as “Kanye” in the 1970s. Rufus is now going to spy on Rittenhouse for Team Timeless! That’s great for them, but bad for him. Probably. What did you all think of this episode? Sound off in the comments below! The man at the end of the episode who is Lucy's bio dad, is the man from Rittenhouse we see at the beginning of the episode threatening Rufus if I am not mistaken.